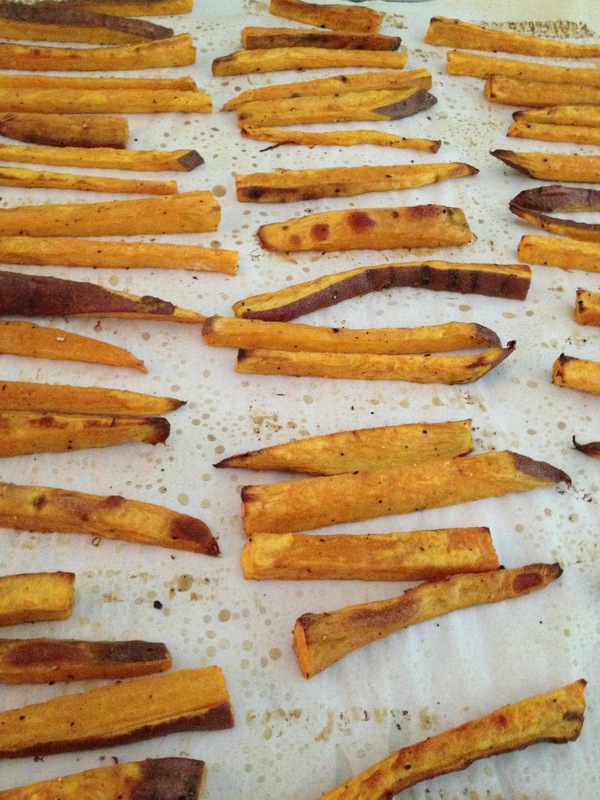 Here is a quick, simple and healthy recipe for Baked Sweet Potato Fries. I had a request for the recipe, but was unable to locate all the pictures I took. But, I’m gonna go ahead and post what I have and I’ll update if I can find the other pics. Work with whatcha got, right!?!?! 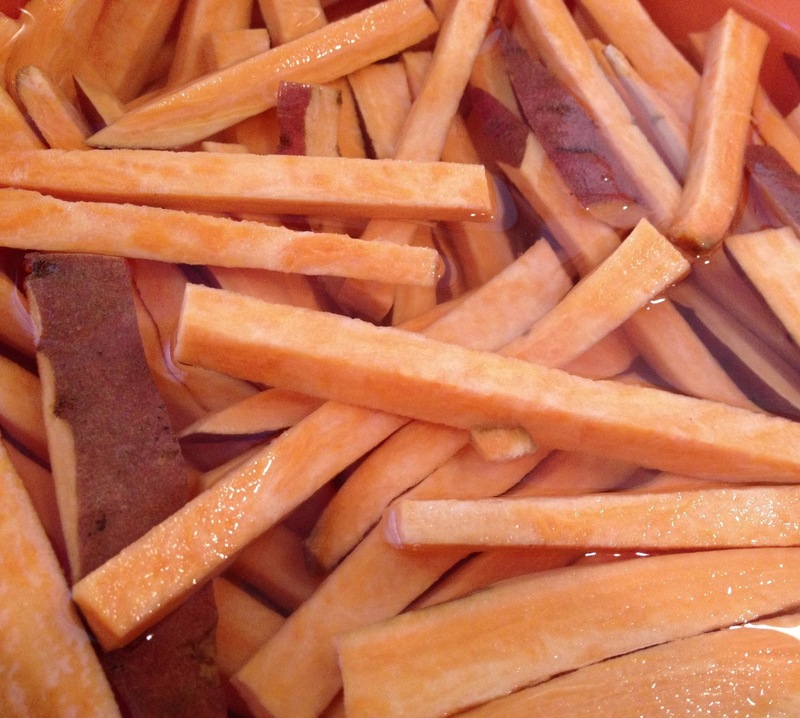 SOAK the cut fries in COLD WATER for AT LEAST 20 mins and up to 2 hours before baking. RINSE, RINSE, RINSE the starchy water off after soaking. Let dry COMPLETELY before Baking. Experiment with different Oils….Coconut, Grapeseed & EVOO have been my Favorites! Change up the Spice Mixture each time….so many options!!! DO NOT crowd the baking sheet. Experiment on Oven Temps and Times until you find the right one for your oven. KEEP THE SIZE OF THE FRIES CONSISTENT! I’ll elaborate a little more on Oils and Spices at the end of the recipe to help give you some ideas! Try and Slice 1/4 inch Matchsticks Consistently. The more uniform in shape and size, the better results! 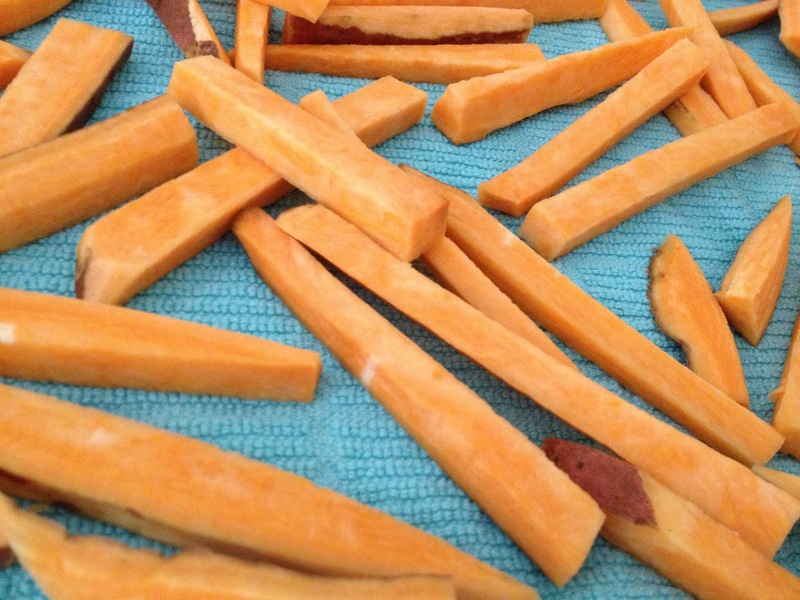 Slice the Sweet Potatoes into fry shapes! You can use and thicker or thinner slice depending on your preference, however, I have found that the slimmer fries tend to give better results. Thicker fries sometime burn too much on the outside before the inside is cooked, resulting in a limp yucky fry. Nobody wants that. If you like them thicker, be sure to adjust your Oven Temp LOWER so they will cook properly…and you will need to bake them longer as well. Also, I use Organic Sweet Potatoes and keep the skins on for a more rustic fry. You can peel them if you’d like. A lot of a potatoes nutrients are in the skins, so if you can buy organic, I recommend leaving the skins on!!! This will help remove some of the excess starch from the potato, which makes MUCH crisper fries. DO NOT SKIP THIS STEP. Even if you only have 10 or 20 extra minutes to soak them….do it. An hour is even better. And after, be sure to rinse the fries really well!!! Get all that starchy water off the fries! Make sure they are good and dry BEFORE moving on to the next step! I usually lay mine out on a dishtowel for a bit to air dry. If you are in a rush, you can towel-dry and pat them off real good….just make sure you get them nice and dry! Next step is changeable and I do not have the pictures to help demonstrate. So, I’ll try and walk you through the options. I used to put all the dry fries into a big bowl and toss them REALLY GOOD TO COAT with 3-4 T EVOO, Kosher Salt and Pepper. They turned out fantastic. Then, I tried a lighter Grapeseed Oil to replace the EVOO and cut it down to 2-3 T. This also worked and the fries came out great! I used a mix of cinnamon, chili powder, brown sugar and garlic salt. Freakin’ Delicious. Then I decided I wanted to experiment a little and cut down the Oil to as little as possible and see what would happen. Trying to keep it as healthy as I can, but not limit the flavor and crispness of the fry, I used Organic Coconut Oil Spray. Lemme tell ya……IT WORKED!!!! 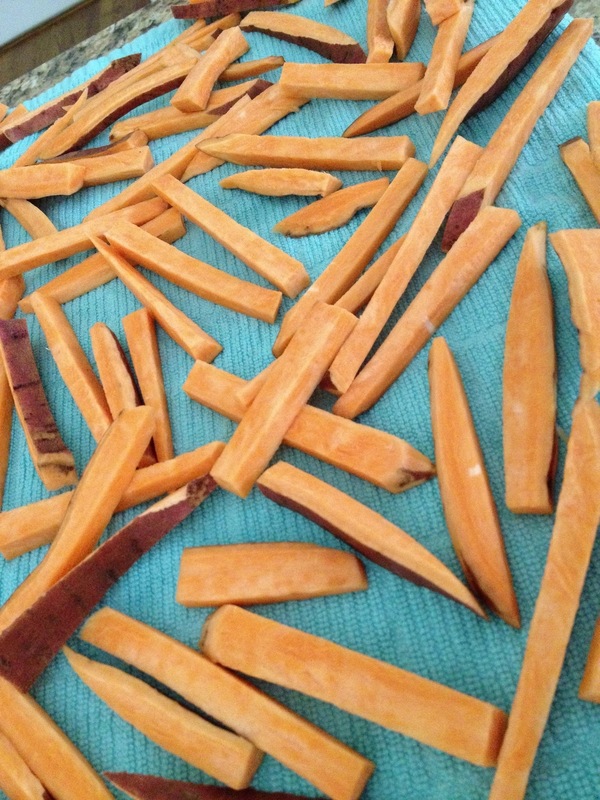 Coconut Oil + Sweet Potatoes = French Fry HEAVEN!!! Wonderful combo and baked absolutely beautifully!!!! The ends didn’t burn as much (like with EVOO), and they were light and crispy and not limp at all. 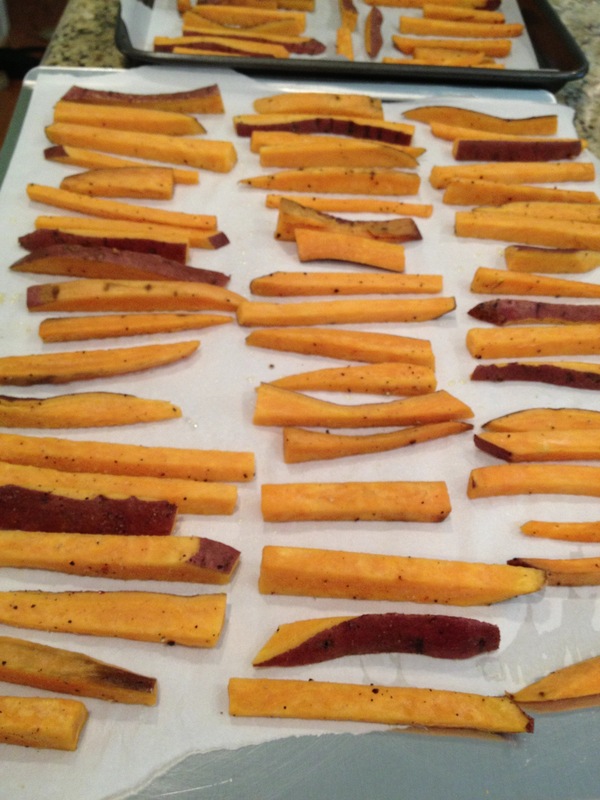 Be sure to lay your fries in a SINGLE LAYER on a parchment covered baking sheet. DO NOT CROWD the fries and do not let them touch or overlap! This will allow all your fries to cook evenly and to get the right amount of brown crispness to them. SUPER IMPORTANT if you don’t want soggy limp fries! Use 2 baking sheets if you need to. And, this is a wonderful recipe to let the kids help with. They loved helping me line them up. Get your kids involved in the kitchen and cooking process….they will be more inclined to eat what they have helped cooked. Dash told me “These are the best fries I’ve EVER had!”….and that’s saying a LOT from Captain Picky!!! Set Oven to between 350 and 450 depending on your oven. Best to start at 400 and see how your oven is cooking. I have a new oven, and it cooks SO FAST….almost like a convection oven. The first time I cooked SP Fries here I did it on 425 and it burnt the crap out of them. I now back it up to 350, but I feel like in my old oven that temp would be closer to 400. So, I’d start there and let the experimenting begin. Be sure to flip them about halfway through (15 mins). Once you can see them starting to brown, flip them and bake another 15 mins or so. If you think they need a bit longer after those 15 mins, flip them once more and turn down the oven about 15 degrees and cook for about 5 mins more. Your total cook time should be 30-45 mins depending on the thickness of your fries and your oven. 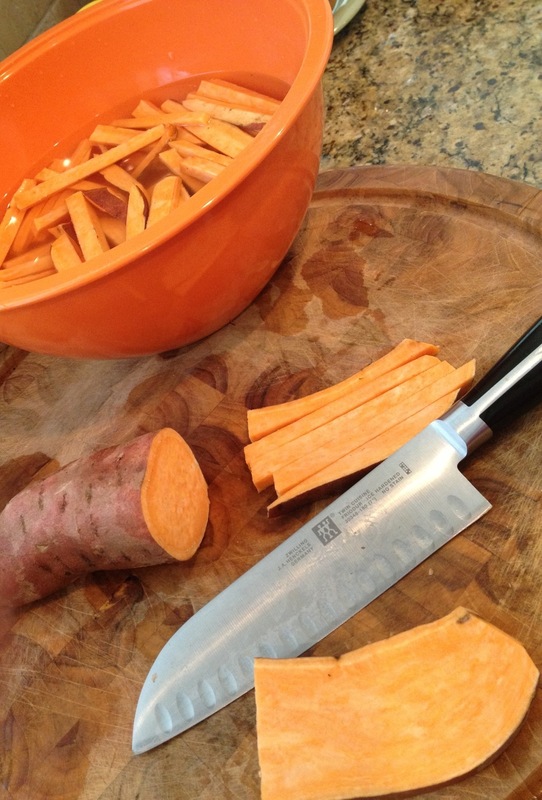 Tip: All of this applies to your regular Russet Potato Fries as well if you don’t care for Sweet Potatoes!